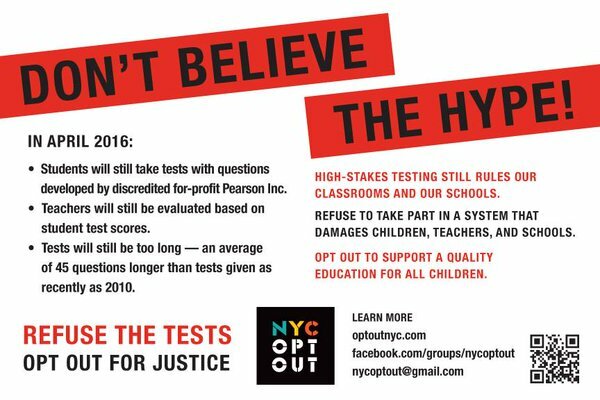 So many reasons to #optout: Let’s keep it going until our kids get the schools they really deserve! There were stories in today's New York Daily News and Politico New York about the dynamite NYC Opt Out press conference yesterday at City Hall, in which parent leaders demanded that DOE inform parents throughout the city that they have the right to opt out of the upcoming exams. There is a dearth of information in many schools about this, particularly in immigrant and Latino neighborhoods, as Johanna Garcia of District 6 Presidents Council pointed out at the press conference – despite the fact the state tests are especially inappropriate for English Language Learners and provide no useful information about their skills or progress. Other parent leaders in schools with predominantly students of color spoke of principals who had misinformed them, saying that their kids could be held back if they opted out -- even though there is a state law barring this. The disparity in information provided across the city is in itself a civil rights violation, parents maintained, reflecting and perpetuating separate and unequal conditions in our schools. Last year, I appeared on a news show with Angelica Infante-Green, then NY Associate Commissioner of the Office of Bilingual Education, now the Deputy Commissioner. 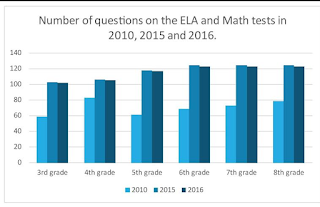 Ms. Infante-Green agreed that the state tests provide NO useful diagnostic information for ELLs, and that then-Commissioner John King had asked for a waiver from the US Department of Education so that ELLs would not have to take the state test for two years. The waiver was denied. Yes, this is the same John King who is now US Secretary of Education. Ms. Infante-Green said the state really believed that ELLs should be excused from taking the test for three years, but they hadn't asked for that as they had thought they couldn't get such a waiver. The test is also particularly abusive to kids with special needs. At the press conference, Brooke Parker spoke about how at a private meeting of District 14 parents with Chancellor Farina, she had asked the Chancellor if her dyslexic daughter, a struggling reader, should take the test, and the Chancellor said no. Here's an account of a similar private meeting with parents in District 15, in which the Chancellor said that parents of children with special needs and immigrants should opt their children out. But why tell this to parents in private meetings, without making this information public throughout the city? Last year, only 6.9 percent of NYC students with disabilities and 4.4 percent of ELLs “passed” or were deemed proficient on the ELA exams. Council Member Helen Rosenthal also spoke about the resolution she sponsored that was unanimously approved by the City Council last year, calling for the right of parents to opt their children out of state testing to be included in the DOE Parent Bill of Rights and sent to every NYC public school parent each year. Although in Schoolbook, it was suggested that there is a risk of losing federal funds in schools with high opt-out rates, this has never happened. As Jeanette Deutermann of Long Island Opt out pointed out at the press conference, there are many schools and districts throughout the state that haven’t made the 95% participation rate for three years and have not suffered any loss of funds. Budget cuts because of high opt out numbers are even more unlikely to occur this year, as it would cause a firestorm and are openly opposed by the Governor, the Commissioner, and the new Chancellor of the Board of Regents Dr. Betty Rosa. More than anything, opting out of the state exams is the most effective tool parents have to protest and disrupt the push to defund, dismantle and privatize our public schools – and turn them into test prep factories where children are treated as data points rather than human beings. The huge 20 percent opt out rates in NY State last year led directly to the Governor changing his position on linking teacher evaluation to test scores, and also helped lead to the selection of Betty Rosa as the new Regents Chancellor. The selection of Dr. Rosa, an experienced Bronx educator with years as a teacher, a principal and a Superintendent, to replace Merryl (“Push kids into the deep end of the pool”) Tisch would never have happened without the huge opt-out movement in NY over the last two years. In fact, in her very first press conference Dr. Rosa said that if she still had kids in the public schools, she would opt them opt. See yesterday's Juan Gonzalez column for more on this: "This grass-roots civil disobedience stunned the politicians and data-obsessed bureaucrats who have dictated public education policy for more than a decade.Ever since then, the bureaucrats have been scrambling to win back the confidence of fed-up parents." Pearson, the company known for writing the ridiculous Pineapple passage and many other confusing and badly designed questions, is still writing the exams this year. The number of test questions has not been significantly shortened. See the chart to the right. While the exams will be untimed, this may mean your child could be subjected to even more hours of pointless stress. · In NYC and many other districts, teachers are pulled out of their classrooms for up to three days to score these exams. The fewer students take the tests, the fewer days they will lose their teachers. Last year, in some Long Island districts, Jeanette Deutermann told me, teachers only were pulled out for scoring for one day instead of three – because so many students had opted out. · There is also the critical issue of privacy. Nearly two years after the state law passed requiring the appointment of a chief privacy officer and a Parent Bill of privacy rights to be created with public input, neither of these events has happened – despite the fact that the legal deadline for both was July 2014. And as we recently found out, the State Education Department decided in 2013 to place all the personally identifiable student data it holds, including their test scores, into the State archives potentially forever – a decision which, despite protests, it still has not revoked. Here’s a nifty quiz you can take yourself about the exams. Here is a sample letter you can send to your principal from NYSAPE; here’s one from Change the Stakes. Here are more detailed explanations by testing expert Fred Smith, Jessica McNair of Opt out Central NY, and NYC teacher Katie Lapham about exactly what has and what hasn’t changed ,and why the current testing regime produces unreliable results and is bad for kids. This Saturday, at the office of Senator Bill Perkins at 10 AM, there's a meeting to provide parents with more information on this issue. Address: Adam Clayton Powell State Office Building 163 West 125th Street, Conference Room B. See the video below from NYS Allies for Public Education and another from filmmaker Michael Elliot, with simple instructions on how to opt out. 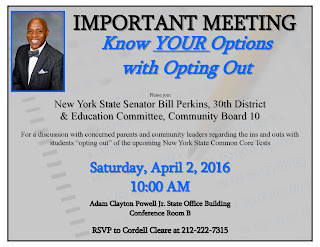 Let’s keep the opt-out movement going until our kids get the schools they really deserve! HOW TO OPT OUT OF THE NY STATE TESTS from Shoot4Education on Vimeo. Please join NPE in Raleigh to be inspired and learn so much! April 16-17. Among the keynote speakers will be Diane Ravitch, Rev. William Barber and author Bob Herbert, Jesse Hagopian, Karran Harper Royal and Dr. Phil Lanoue of Clarke County GA and National Superintendent of the Year. I will be leading a workshop with the co-chair of our Parent Coalition for Student Privacy Rachael Stickland on the fight for student privacy post-inBloom, and another on "Personalized Learning", contrasting the research and reality of class size reduction vs. online instruction. Joining me will be teacher/blogger extraordinaire Peter Greene and attorney and columnist Wendy Lecker. Here is the full schedule of events; click the right hand arrow for Sat. and Sunday and this page to register and get info on how to reserve your hotel room etc. I am on the board of NPE, and I'm proud to say it has become the leading national organization of parents, teachers and advocates fighting the forces that undermine our public schools, including high-stakes testing, budget cuts and privatization. Each year the opportunity to meet with like-minded allies and share strategies and information is tremendously helpful and even inspirational. This year promises to be our best yet. Please join us if you can! Tomorrow the documentary "Killing Ed" opens at the Cinema Village on E. 12 St., and will run for only a week. See the trailer below. It's about the largest chain of US charter schools, led by a politically influential Turkish Imam living in Pennsylvania named Fethullah Gulan. This school year, 155 Gulen charter schools operate in 26 states and the District of Columbia under different names, including New York. The chain is also under investigation by the FBI for various alleged abuses. This Friday, the filmmaker and Sharon Higgins, a Gulan expert who is interviewed in the film and blogs at Charter School Scandals, will be at the 7 PM show to answer questions afterwards. Buy your tickets here. Item 6 (page 20) Bard College. Inexplicable why this is retroactive. The relationship with Bard has been in place for years. Item 13 (page 39) Silicon Valley Mathematics Initiative: consulting to develop tests to measure teachers for performance reviews. Item 13 (page 39) Silicon Valley Mathematics Initiative is a consulting engagement to develop tests to measure teachers for performance reviews. This work is controversial in light of 1) the thorough discrediting of value-added measurement models by the academic community and 2) action to eliminate state tests in rating teachers. The contract should be presented with more information including the RFP and statement of work. It should be presented for approval before it's done, not after. There are eight Head Start or pre-K contracts that have no information: Items 15, 16, 17, 26, 27, 28, 29, 30. One (item 16 on page 46) is for "lead teacher incentives". That sounds like something that would require a discussion. DOE continues to present contracts for approval with no names or amounts reported despite the promise of DOE to reveal this information at least a month ahead of the votes. DOE spends vast amounts of money on professional development -- $70 million has been approved since October of 2105 -- without any assessment of the efficacy of this spending. This month the requested funding is another $500,000. For numerous textbook and online program contracts, there are no comparative evaluations of quality or market research as to why these particular vendors were chosen; with less analysis offered than in the detailed description of why a particular vendor for snow tire chains was selected. The proposal to pay Bard College nearly a million dollars for additional services to the two Bard High schools, which are both highly selective schools with comparatively few high-needs students, does not appear to be aligned with their Fair Student Funding system. Are you interested in how bloggers like Dora Taylor, Jonathan Pelto and I uncover lies, corruption, waste and fraud involved in corporate education reform? We'll be sharing investigative tips, techniques, strategies and some of the big stories that resulted, during a free and LIVE webinar this Thursday March 24 at 8 pm Eastern. I co-authored a Gotham Gazette article published yesterday on the need for more school seats and reforms to the school planning process yesterday with Javier Valdez of Make the Road NY. See also the story on NY1 on the hearings. Yesterday, in a crowded Committee hearing room at City Hall, the City Council Education Committee held hearings on the five-year capital plan. Among those testifying were Eduardo Hernandez, President of Community Education Council in District 8 in the Bronx, Shino Tanikawa, President of Community Education Council 2 in downtown Manhattan, Midtown and Upper East side and co-chair of the DOE Blue Book Working group; Fe Florimon, President of CEC 6 in Upper Manhattan and chair of Community Board 12 Youth and Education Committee; Maria Roca of Friends of Sunset Park in Brooklyn,; Luke Henry, a member of CEC 1 on the Lower East Side and co-chair of the Youth and Education committee of Community Board 3; Mary Winfield, East Harlem parent activist; MC Sweeney, member of Community Education Council in D28 in Queens; and Bertha Asitimbay, a parent leader at PS 19 in Corona and a member of Make the Road NY. All spoke eloquently about impact of overcrowding in their neighborhood public schools and a broken school planning process that needs critical reforms or else the problem will worsen with the thousands of new housing units resulting from the Mayor's rezoning proposals. Below is my testimony and that of Marie Winfield. Deputy Chancellor Elizabeth Rose led off by saying that the DOE needs estimate of 83,000 seats was based on updated enrollment projects and a new Blue Book formula. Despite the fact that there are more than 550,000 students crammed into overcrowded schools according to the DOE's own figures, she continued the implausible line started during the Bloomberg administration that there was merely "pocket overcrowding." Dromm asked if its true that they never use eminent domain to site a school unless the property had recently been on the market; SCA President Lorraine Grillo confirmed that this was true. She also said that she would welcome a committee or taskforce to look in depth at the problems with school siting. Dromm asked why the city rejected the Blue Book Working group recommendations to align the school capacity formula with smaller classes; Grillo said that this was still a "work in progress." CM Margaret Chin asked why they were now building "gymnatoriums" -- combined gyms and auditoriums rather than separate spaces for each. Grillo said it was matter of space and only happened in Elementary schools where the auditorium is not needed often. Chin also asked what reforms are needed to see that schools are built along with housing, especially since the Mayor's new housing plan is accelerating the creation of new residential units through rezoning. She added, whether they would support "impact fees" on developers with funds available for infrastructure including schools. Rose said there were areas with new housing with underutilized capacity (really?) as for impact fees, that was a state matter. Would the SCA help us, asked Chin? Grillo said we won't comment on this. CM Rosenthal asked what changes in the procurement process have been made since the inflated $1.1 billion contract to Computer Specialists that was later rejected by the city and rebid at a savings of over $600 million. Rose deferred to Ray Orlando of the DOE budget office. Rosenthal said she had spoken to Orlando and hadn't gotten any answers. CM Brad Lander thanked the DOE for the extra schools they've built in his district and the new seats D15 is receiving (they added 1648 seats, but are only funding 50% of their own estimate of need), and then asked about air-conditioners and bathrooms. Rose said air conditioning is not eligible for capital funding, which must come from the "school community" (meaning PTA funds?). Rose said that there will be a public forum on the spending of the Smart Schools Bond act on March 31. CM Menchaca asked whether they were budgeting enough for the higher prices of real estate; and need team to focus on creative methods to acquire sites, such as land swaps. Grillo said they'd never rejected a site because it was too expensive in an area of real need. (really?). CM Levine praised dual-language programs; asked if they are more expensive? Dromm reminded him that this was a capital hearing, and to hold that question for the expense hearing next week. He said he was "excited" about the new Blue Book, but asked how a school without a library or gym could be identified as under-utilized, even though these spaces had turned into classrooms because of overcrowding. Grillo said she could sit down with him to explain this. CM Dromm asked whether the target class sizes in the Blue Book formula in grades 4-12 are larger than the average class sizes in these grades. Rose said that was true. Why did they reject the recommendation to align the formula to smaller classes? Grillo: the BB Working Group is "still in progress" and nothing is off the table. CM Reynoso spoke passionately about the lack of gyms in so many schools, including PS 18, a school with a small cafeteria that is combined with a gym and a lobby, with columns in the middle. The principal's office is in a closet. Rose says we would like to solve the problem of lack of gyms throughout the city. CM Treygar pointed out the thousands of unmet seats in his district; charter co-locations which made the situation worse; and temporary boilers three years after Sandy wrecked the original ones. Rose added that $72 million is being spent on new partitioning due to placing of School-based health centers for the Community Schools initiative. There is more at the video link to the hearings- though the video only starts working at 58 minute in; I speak at 2.23 in, and my written testimony is below as is Marie Winfield's. Please check it out for the eloquent testimony of our parent leaders.